After spending over two months in Russian prisons, first in Murmansk and then in St Petersburg, the Russian courts have decided to release the 28 Greenpeace activists and two journalists who known better as ‘The Arctic 30’. The group was initially detained when the Russian coast guard boarded their ship the Arctic Sunrise following a Greenpeace action at a Gazprom oil rig in the Russian Arctic. The arrest was met with international criticism after Greenpeace claimed that their ship was in international waters when it was boarded and captured by the Russians. 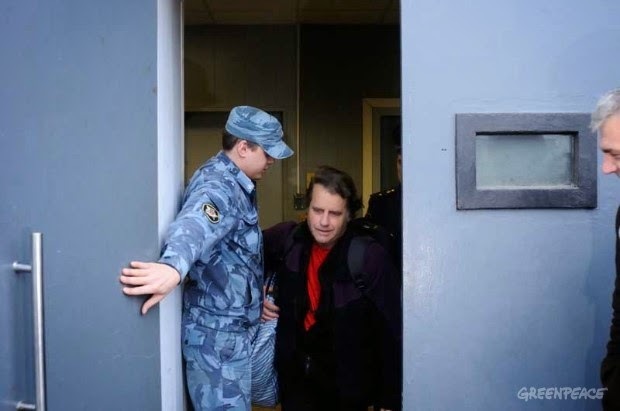 This prompted the Dutch government to file a legal suit against Russia under The International Tribunal for the Law of the Sea (ITLOS), requesting the immediate release of the Arctic 30 and the Arctic Sunrise. 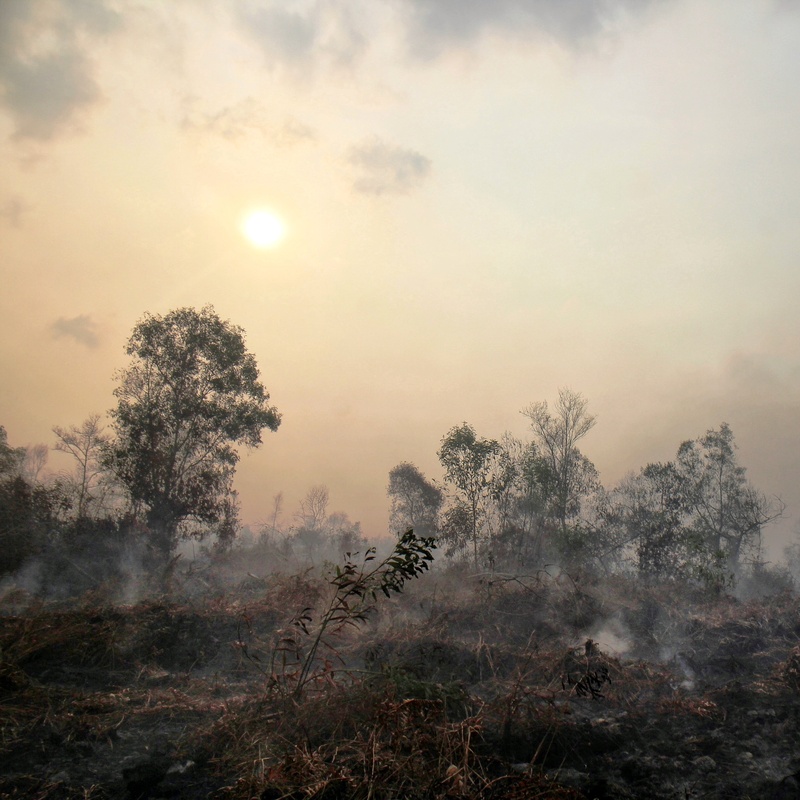 Russia has refused comply with the ruling. 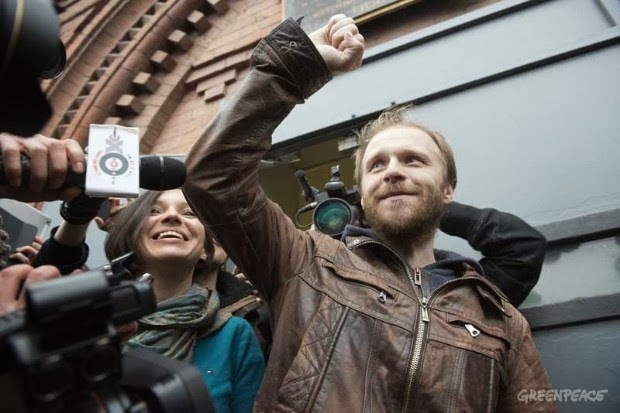 The Arctic 30 have since been released on bail, however still can’t leave Russia and the charges against them of ‘hooliganism’ and ‘piracy’ still stand. International speculation suggests they might be granted amnesty by President Vladimir Putin, but this remains to be seen. Ana Paula Alminhana Maciel (from Brazil) was the first of the Arctic 30 to be released on bail from SIZO 5 detention centre in St. Petersburg, on the 20th November. 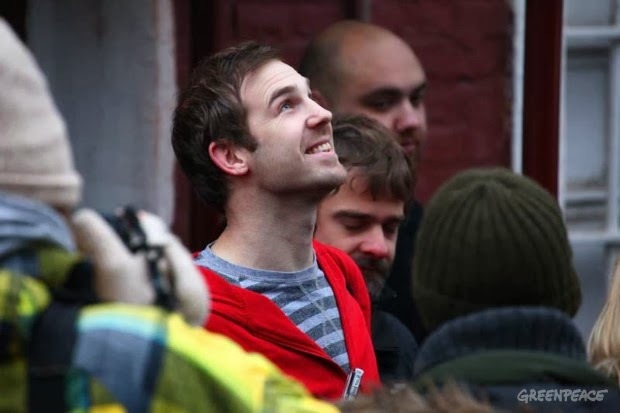 Russian freelance photographer, Denis Sinyakov, released on bail from the SIZO 1 detention centre in St. Petersburg. 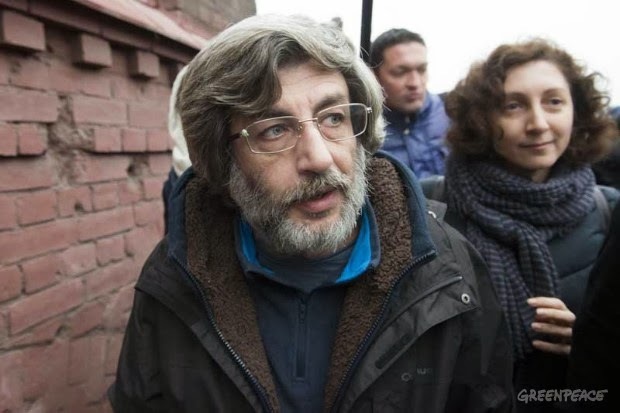 Andrey Allakhverdov (from Russia), released on bail from the SIZO 1 detention centre in St. Petersburg. 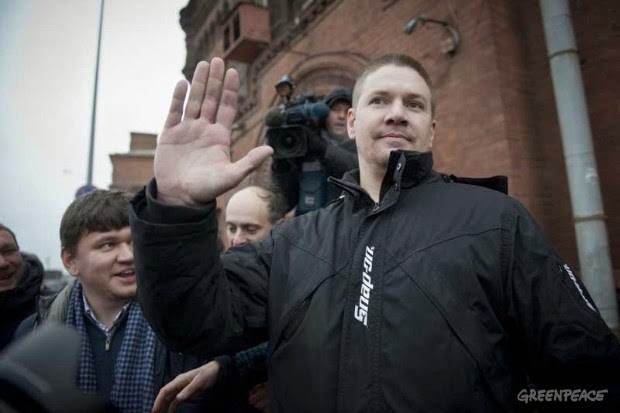 Tomasz Dziemianczuk (from Poland), released on bail from the SIZO 1 detention centre in St. Petersburg. 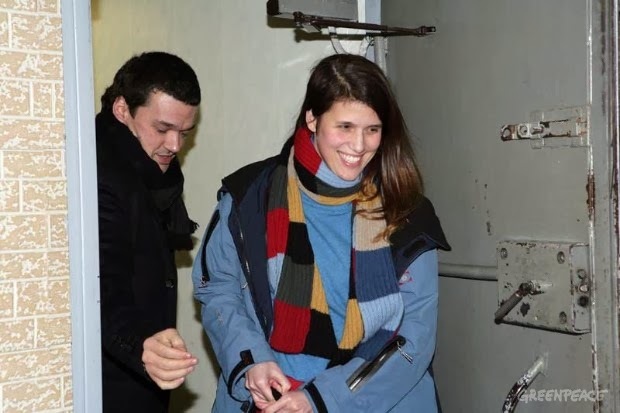 Camila Speziale (from Argentina), released on bail from SIZO 5 detention centre in St. Petersburg. 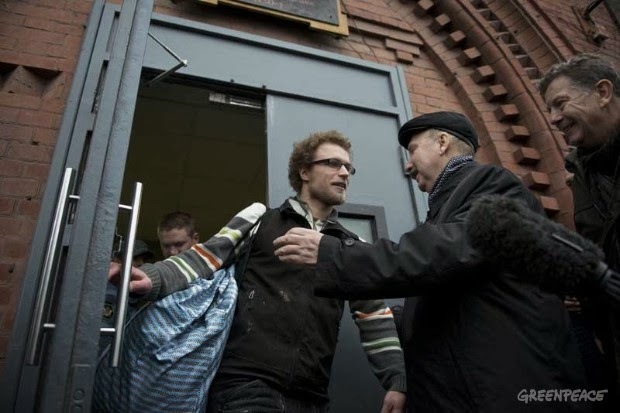 Sini Saarela (from Finland), released on bail from SIZO 5 detention centre in St. Petersburg. On Friday 22nd Novembeer, freelance videographer Kieron Bryan (from the UK) was released on bail from the SIZO 4 detention centre in St. Petersburg. 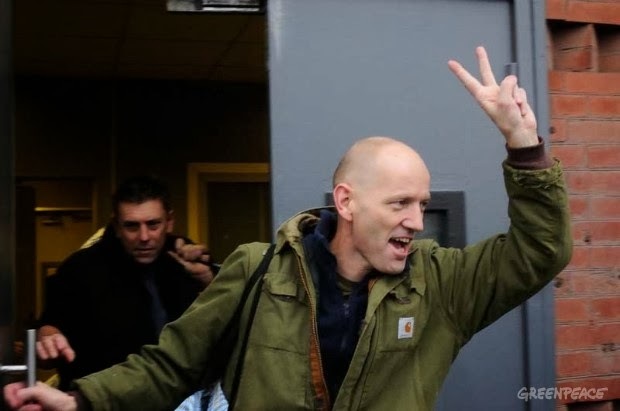 Captain Pete Willcox (from USA), released on bail from the SIZO 1 detention centre in St. Petersburg. Anthony Perrett (from UK), released on bail from the SIZO 1 detention centre in St. Petersburg. 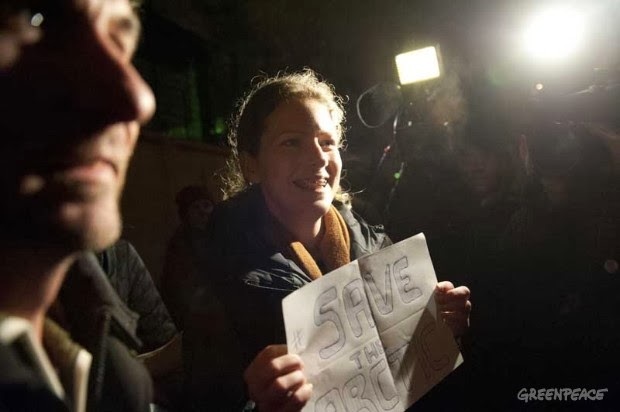 :Frank Hewetson (UK) is followed by Jonathan D Beauchamp (New Zealand) as the Greenpeace International activists are released on bail from the SIZO 1 detention centre in St. Petersburg. 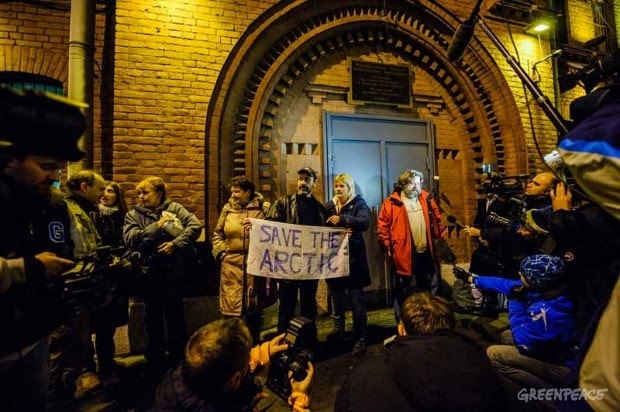 :Dimitri “Dima” Litvinov (from Sweden/USA on left) and Roman Dolgov (Russia) hold a banner reading: ‘Save The Arctic’ as they are released on bail from the SIZO 1 detention centre in St. Petersburg on the 22nd November. ← What happens when creatives and renewables collide?